Deer will eat just about anything if they are hungry enough, according to Oregon State University's Extension website. Still, some plants are less attractive to deer than others. Although deer may occasionally munch on bougainvillea, they usually don't like the plant enough to destroy it. In fact, the University of California rates bougainvillea as a "reasonably safe bet" when it comes to deer-resistant plants. Bougainvillea is desirable for its showy colored bracts, or modified leaves. They come in shades of red, purple, white, yellow and pink. Some are even bi-colored and have variegated foliage. These sprawling plants are vines that can grow up to 30 feet long or tall if they have something to climb on. They are highly attractive spilling over a container or retaining wall. They are not friendly to the touch, however, as they have sharp thorns. In fact, the thorns are likely one reason why deer tend to avoid the plant. Bougainvillea is a warm-climate plant. Frost will kill it. It grows best in U.S. Department of Agriculture plant hardiness zones 10 and warmer. 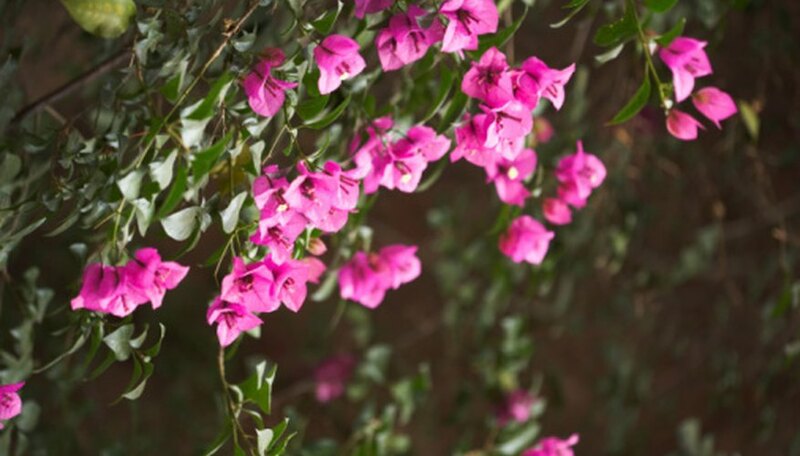 For this reason, bougainvillea is often grown in a container and brought indoors for the winter. It can also be grown indoors year-round. If you have a deer problem and want to make sure your bougainvillea is left alone, consider planting it in a hanging basket and hanging it high enough so that deer can't reach it. Keep your bougainvillea healthy and it will survive the occasional feeding from a deer much easier than unhealthy plants. Locate it in full sun and in neutral, well-draining soil. Let the soil dry out to the touch before watering the plant. Fertilize bougainvillea in early spring and again in July with a balanced (10-10-10) fertilizer. The plants take severe pruning very well and should be pruned back in the fall to maintain their shape and remove dead wood. Bougainvilleas suffer from pests other than deer. Indoor plants can become infested by common houseplant pests such as mealybugs and scales. Fungal diseases, which are often caused by overly wet soil or letting water sit on the leaves of the plant, can also harm bougainvillea. Aphids on outdoor plants can be pesky as well. Spray the plant with an insecticidal oil to get rid of insect pests. Water sparingly and only at the base of the plant to prevent fungal diseases such as leaf spot and root rot.